If you are a partner and work with customers who have companies across the globe or if you are one of our customers who has companies in different countries or regions, be sure to check out our country/region-specific application user help content on TechNet for AX 2012. We have help content in English as well as in many other languages. For additional information about country/region-specific help content, see http://technet.microsoft.com/en-us/library/gg213693.aspx. Where is the country/region-specific content? Our country/region-specific help content is prefaced with the ISO code for the country that the content was written for. For example, see the following screen capture of a Brazil AX 2012, which is prefaced with the alpha-3 ISO code for Brazil. For more information about ISO codes, see http://en.wikipedia.org/wiki/ISO_3166-1. 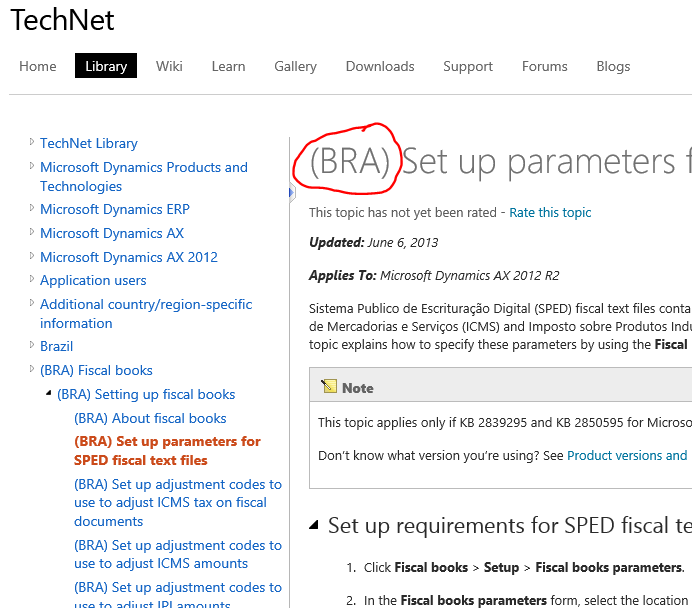 If you understand the way that we designate country/region-specific content for AX 2012 on TechNet, you can use this to your advantage to improve your search results. For example, if you’re searching for information about a Japanese feature in AX 2012, be sure to include “JPN” and “AX 2012” in your search string.